This card is attracting a lot of attention because of it’s basically a modal spell which is also always a creature. If that sounds better than a lot of modal spells, it’s because it often is: you get whichever effect you want and also something that can win the game. Note, however, that it doesn’t technically obsolete quite as many cards as it might first look. For example, Loxodon Hierarch always gives you both four life and the four-power attack and defense, and Reclamation Sage is an elf for decks which care about things like that. On a different note, I have to admit to a little bittersweetness about the name “Knight of Autumn” being used in this context. That’s one of the best possible card names for an Arthurian or Celtic block, which it doesn’t look like we’re getting in the near future. Although, I suppose people are often asking for more reprints, and you could quite easily adapt dryads as denizens of Avalon . 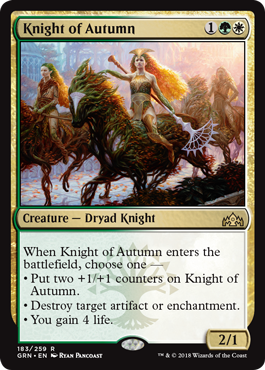 . .
Knight of Autumn is not a flashy card, but it is very powerful and will see a healthy amount of play in Standard (and maybe some fringe Modern play; 3 mana is a nice sweet spot, and decks do like Naturalize effects!). Almost all Selesnya decks in Standard will have a use for Knight of Autumn, and I can see it having a major role in the upcoming Standard.